WASHINGTON, DC, January 19, 2011 (ENS) – A federal judge has declined to dismiss a National Mining Association lawsuit alleging the U.S. government has unlawfully blocked surface coal mining efforts in Appalachia by imposing additional requirements for obtaining valley fill permits under the Clean Water Act. Mountaintop removal coal mining operations need valley fill permits to dispose of the tons of waste rock blasted away to reach coal seams beneath the surface. Coal companies dump the rock into valleys beneath the coal-bearing mountains. The U.S. Environmental Protection Agency estimates that almost 2,000 miles of Appalachian headwater streams have been buried by mountaintop coal mining. Judge Reggie Walton of the U.S. District Court for the District of Columbia Friday denied a motion by the U.S. EPA and the U.S. Army Corps of Engineers to dismiss the industry’s lawsuit. 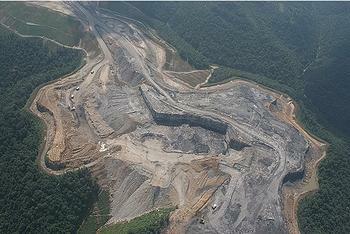 Judge Walton ruled, “The Court finds the plaintiff’s arguments more persuasive and agrees that the plaintiff is likely to prevail on its claim that the EPA has exceeded its statutory authority” under the Clean Water Act by issuing a series of memoranda and a detailed guidance that strengthen the water quality standards that mountaintop removal mining operations must meet. The Spruce No. 1 mine, as proposed, would bury more than seven miles of headwater streams, impact 2,278 acres of forestland, and degrade water quality in streams adjacent to the mine in Logan County, West Virginia. The mine was permitted in 2007 and but delayed by litigation. The EPA vetoed its permit on January 13. Quinn said the National Mining Association was “encouraged” by the judge’s ruling even though the court dismissed industry association’s request for a preliminary injunction to block implementation of EPA’s policies. Quinn said the court agreed with the association’s contention that the Clean Water Act envisions a much more limited role for EPA than has recently been pursued by the agency. “It seems clear … that Congress intended the EPA to have a limited role in the issuance of Section 404 permits, and that nothing in Section 404 of the Clean Water Act gives the EPA the authorization to develop a new evaluation or permitting process which expands its role,” the mining association executive said. Section 404 permits are issued by the United States Army Corps of Engineers “for the discharge of dredged and fill material into navigable waters at specified disposal sites.” The Corps has sole authority to issue Section 404 permits, but in doing so it must apply guidelines that it develops in conjunction with the EPA. The industry is challenging a September 2009 assessment in which the EPA identified 79 coal-related pending Section 404 permits that would be subjected to a new “enhanced coordination process” the EPA established earlier in 2009, which the industry is also challenging in this case.